1) MAP BLOCKS: On the back of a previous fix, I decided to improve the "door code" so that monsters do clear an associated map block when opening a door if the PCs are nearby. 2) LOAD GAME: There has been some loading improvements, which also required a fix to allow CURSED items to work on a reload properly. 3) MAP PINS: Some map pins were not updating due to other nearby potential targets being activated instead. The target system for such has been fixed. 4) JOURNAL UPDATE: The "Lady of the Lake" journal had a repeated updating due to an error in a conversation. This has been addressed. 5) TB COMBAT: Some creatures were slow to start TB COMBAT upon activation. This has now been fixed. 6) AUTO EXAMINE OBJECTS: Some placeable objects are designed to give a full examine feedback prior to further use. Some objects were having issues between showing the info and starting interaction within our MP session, causing difficulty in closing a GUI. This has now been fixed. 7) GOLD HANDLING: This was a bigger issue, and is related to the old Money Pouch issues of previous reports. This time I gave the system a complete overhaul, removing any reliance upon heartbeat calls and ensuring all "Give" and "Take" of gold functions are replaced with my own home-brew versions that immediately fire the weight check scripts upon gold transactions. Furthermore, additional checks at PC entry have been added to ensure gold pouches are not prematurely added when nearby companions with pouches still need to be joined. 8) CURSED ITEMS: There was a timing issue that prevented the cursed items working as expected on a reload of a game. This has now been fixed. Furthermore, the cursed item descriptions have been updated to reflect that such items can only be removed with "Oil of Unbinding" or a cleric can cast Remove Curse on any cursed items that they carry only. i.e. The Remove Curse spell cannot be used to free other PCs of their cursed items. 9) CODE IMPROVEMENTS: I have also reworked some old coding related to storing of items when companions either leave the party or die and leave a tombstone. This had to be done due to the overhaul of the gold related issue. 1) UNDERWATER: I added a "slowed" effect for being underwater. 2) LIGHT BLINDNESS: Credit to KevL who fixed a problem I noticed where Light Blindness was not penalising a PC when in daylight. This code has been slightly altered and added to my campaign to work now. 3) GAME BALANCING: A lot of effort was placed into re-calculating the challenge rating of monsters, both placed and encounters. 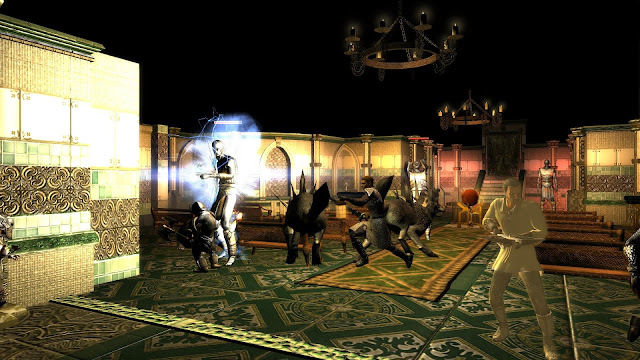 Balancing was adjusted to cater for smaller or larger parties, and the difficulty setting the player had set among other factors. A battle we had on the night showed the balancing was much better and made for an epic battle, in my opinion. 1) DEFAULT STATS: After some feedback, I am considering adding a section to the character sheet that shows the DEFAULT ability and skill values (without any alterations due to bonuses or penalties.) This allows players to more quickly ascertain by how much something has been positively or negatively influenced. 2) HENCHMEN WAIT: After leaving Scraps at the water side and finding him gone upon returning, I am considering possibly allowing such creatures to stay around a little longer "waiting" for the PCs to return than they currently do. Subject to how much time I get, I will look into this. And Are A Formidable Force! The Adventure Continues ... 26. Farewell Scraps! To The Faithful Man's Best Friend. 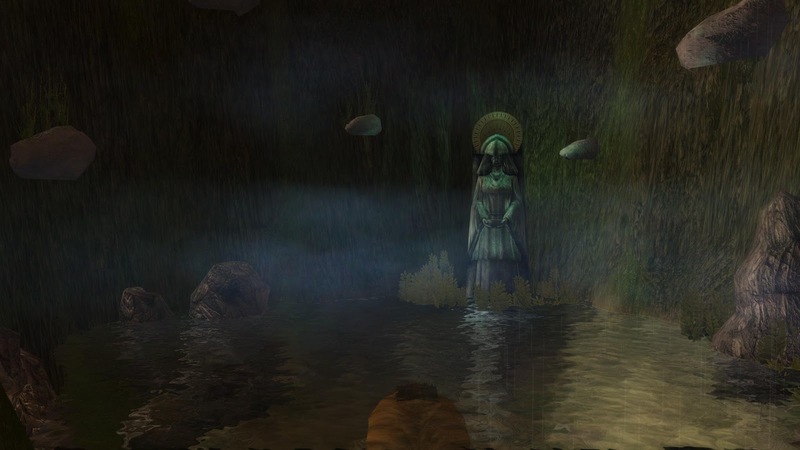 After hiding the gold in a chest back at the Talanthian caves, the heroes retraced their steps to Demon's Bowl where they investigated the lake and its statue. After wading into the water and diving underneath a few times, Helden was quickly able to ascertain that a large cave entrance was accessible below the lakes surface. And after checking the large statue at the back, he soon discovered a small plaque that suggested an answer would aid them in gaining access to the caverns beneath the lake. Thankfully, the heroes had discovered the secret to the statue from an earlier quest at the goblin tower to the east and upon uttering the phrase that the statue sought, the heroes were suddenly enabled with an ability to breathe underwater; rare and wonderful magik! With their new found ability, the heroes made their way through the cavern system and to an underwater grotto on the far side. Conscious that the magik may not last for long, the heroes wasted no time in exploring the area as quickly as they could, even though the drag of the water slowed them down greatly. 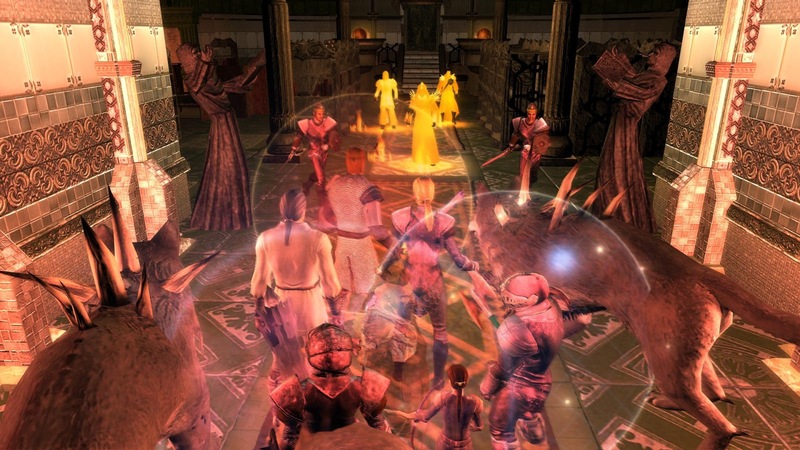 It did not take the heroes long before they came across the sarcophagus remains of Arlen .. and within only a few heartbeats later, they also were confronting the remains of Arlen herself. This watery undead monster was in no mood to talk and came into instant combat with the heroes who had come to disturb her peaceful rest. More than once, the heroes felt her drag Life Essences from them in the way that undead do, but after a short while, Helden, Flint and Myara were able to bring her down with the aid of some magic missiles from a wand of Karasten's. (It had been obvious spells were likely to fail down here.) The turning attempts of the clerics had simply not been good enough. After relieving the water undead of her treasures, the heroes continued to explore the small area. Indeed, there was little else to find, although they did also encounter a Sea Hag that gave them a frightful gaze. Again, however, the heroes still won the battle, and apart from some small treasure, they found little else and decided to leave the watery grave behind. "Scraps! Here boy! No, he's nowhere to be found." said Helden hoping to be reunited with his faithful hound after the animal had refused to follow the heroes into the watery caves. Scraps, however, was nowhere to be found, and Helden silently hoped he had made his way back to the safety of the village .... somehow. After all, he was a smart dog, and intelligent enough even to enter a teleport if he had to. After drying themselves off, the heroes continued their main quest. It was night time now, and the Talanthian tower looked ominous as its lights shone in the night. Carefully navigating the suspension bridges, it did not take the heroes long to reach the entrance. It took just a little longer for Myara to bypass the magikal lock that protected the tower's entrance. Once inside, the heroes could tell this tower was different to the last two. This one was nicely decorated and obviously still used. Helden made his way across the room of what appeared to be some sort of chapel. In an alcove he spied a golden statue and picked it up. Immediately two statues, previously lifeless, sprung to life and attacked the heroes. The leader's lust for gold had triggered the two huge pewter statues to life and they meant business. Although surprised, the heroes were already quite rested and so were quite prepared for combat. As much as the huge statues pummelled into Myara, they could not deliver the final blow before the rest of the party had delivered a strong defensive attack of their own. It was not long before the two statues crumbled into nothingness, relieved of the magik that bound them. Furthermore, Helden was now quite prepared for a similar attack from two other nearby statues that he knew would animate after he picked up a second nearby treasure. No lumbering statues, no matter how big, were going to get between Helden and his gold! After recovering from the battle with the pewter statues, the heroes readied themselves for the next chamber that was on the level above their current. It was obvious this place was inhabited, and more than likely by Talanthians ... and even more likely to be found on the next floor. Fully buffed with protection magic, and having shared the Life Essences between them, Helden felt they were prepared enough to meet anything, and so they climbed the steps to the next level. Sure enough, as the heroes entered the next the next level, they were greeted by a smooth talking Talanthian who introduced himself as Herodias and simply asked why they had entered his tower. Helden's sarcastic answer did not help matters, and soon the inevitable happened: combat was started. This was never going to be an easy battle though. Immediately two Talanthian guards blocked the way to the three Talanthian clerics beyond, who in turn, immediately started to cast spells. This was unlike any battle the heroes had encountered before. Normally they were the ones with the advantage of spell casters, but now they had met their equal. Even as the fighters approached the combat, they were dazed and left dumbfounded unable to return any sort of melee. This was not going well. 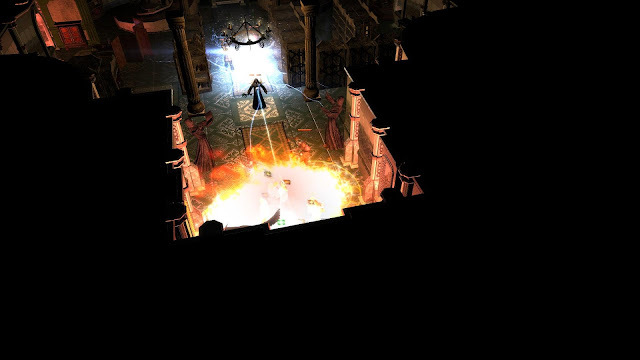 Next, the heroes were engulfed in flames as the enemy spell casters took advantage of the situation. Meanwhile, all the heroes had done was summon creatures, but did so right in the flames of the enemies spells. As a result, the summons were dismissed by fire almost as quick as they had arrived. 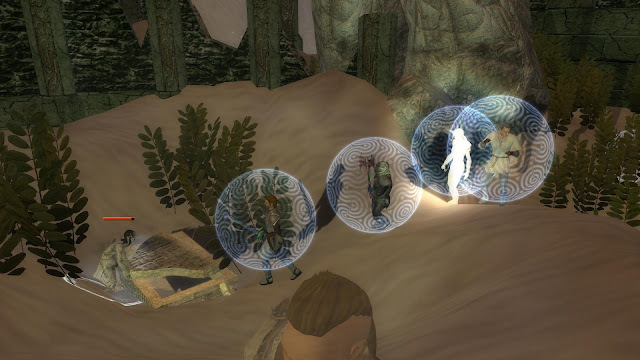 Myara was doing her best with her bow, and Threska tried to aid the fighters as Karasten simply had to try and run from the Talanthian fighters who had started to focus on him. And as drastic as this tactic had sounded, placing the magic user in great danger, it was also the break that the heroes needed to allow time for the fighters to recover. So, even as the wizard was falling from the blows of the enemy, Elana too, the fighters were at last finding their feet. Thankfully, even though the fighters were also being punished by the Talanthians again now, they were able to stay standing by the energy of the Life Essences. The careful deployment of these vital essences were paying dividends, by the very fact that the Talanthians were now unable to deliver enough final damage to drop the fighters. Their delay by concentrating on the wizard and cleric and not being prepared for such resilience in the fighters caused the tide of battle to change. For now, Flint and Helden were able to add their mighty blows to the still arrow firing halfling. Now, the battle was turning. 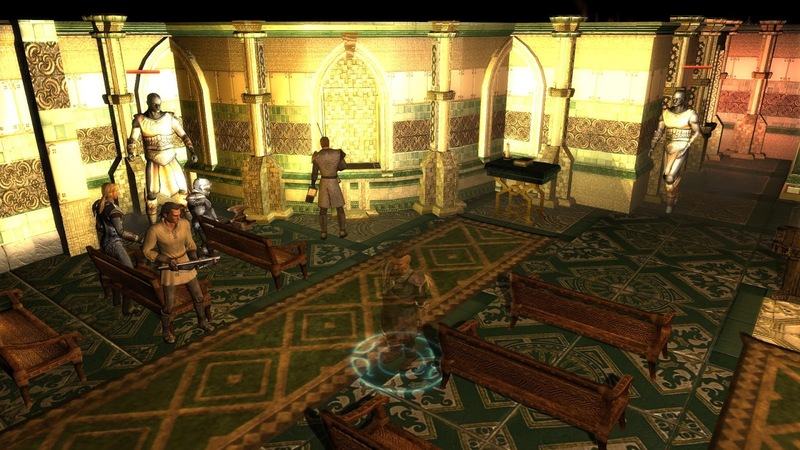 In fact, as soon as the heroes had managed to bring down Herodias, and a cleric, two of the enemies summons also dissipated, leaving the final cleric and fighters vulnerable to the heroes blades. Now, victory that had seemed so distant to the heroes at the start was now assured, and as the fighters delivered the final blows, it was not long after that they were tending the wounds of the fallen. A few minutes later, everyone in the party had received healing and were discussing how better they may have been able to manage the battle if they encountered another situation like that. In this way, they grew in confidence and experience. The wounds healed by the clerics prayers, the heroes were now able to explore the library (for that is what the room was) in peace. Karasten was in his element as he went from bookcase to bookcase, grabbing as much information and recipe pages as he could find ... and he found a lot! Unfortunately, however, in his zeal to grab as much information as he could lay his hands on, he also grabbed a cursed book, which instantly affected him in his reasoning. Sadly, even the clerics were unable to remove this curse, and they all knew it would mean acquiring some Oil of Unbinding at the next available opportunity before the wizard would be able to relieve himself of its evil effects. 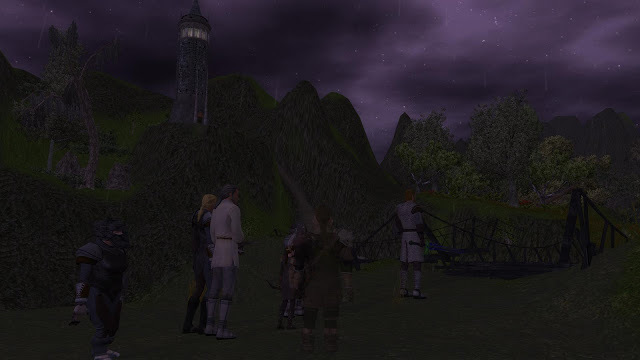 The books searched, and the bodies of the Talanthians looted, the heroes found a key that they guessed they would need to further explore the tower. If this was the owner of the tower, as the evil cleric had stated, then hopefully, it would mean any further encounters may be a little easier ... but things did not always work out like that. TOTAL SESSION TIME (UNPAUSED): 2 Hours 24 Minutes. GAME TIME SINCE START: 52 Hours 13 Minutes.